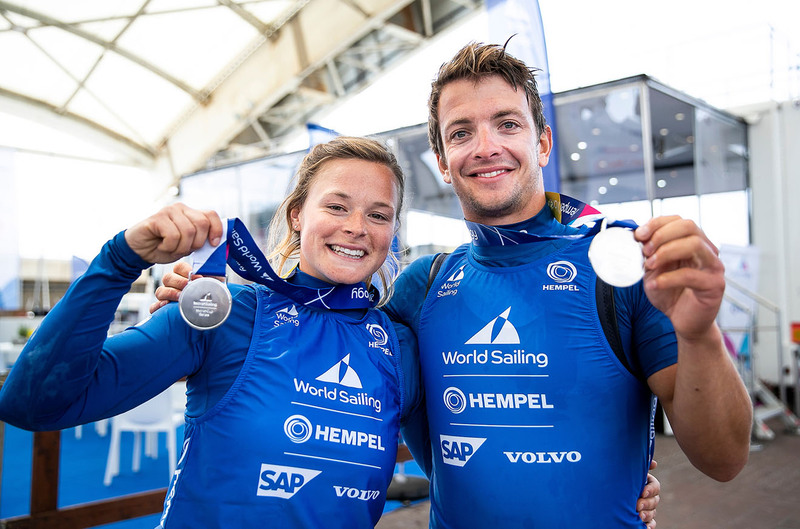 The British Sailing Team’s 49er pairing of James Peters and Fynn Sterritt have provided us with a masterclass in how to win gold this week, leading the fleet into the medal race after only finishing outside the top ten twice in the nine previous races. This is the kind of consistency that’s only achieved by careful assessment of the risk of every tactical and strategic decision. So it’s no surprise that they sealed the gold with a medal race win that demonstrated those same values of smart planning and thinking. Going into the medal race they were tied on points with Poland’s Lukasz Przybytek and Pawel Kolodzinski, with the New Zealand pair Logan Dunning-Beck and Oscar Gunn another four points behind. 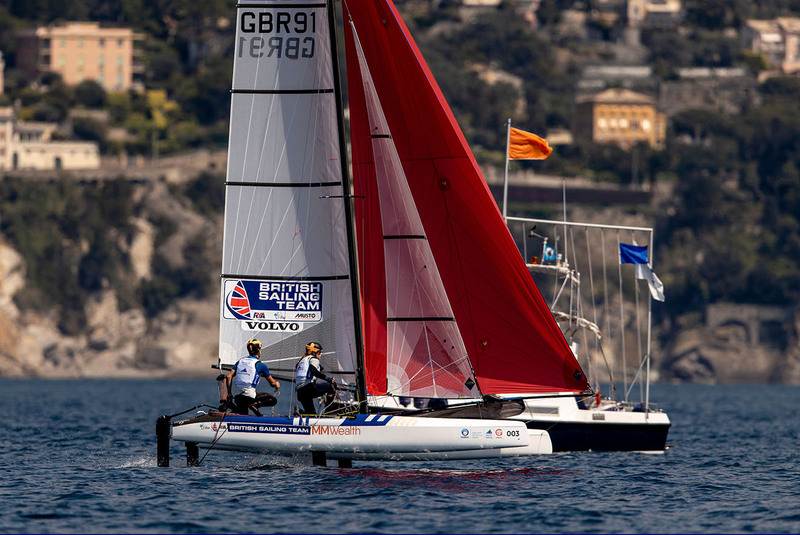 Two close challengers meant it was unlikely to turn into a match race, so they could maintain their normal fleet race strategy. If we look at Image 1 with 1min 42secs to the start, Peters and Sterritt (GBR5) are highlighted in red. We can see that they had already completed a full speed practice start from the committee boat. 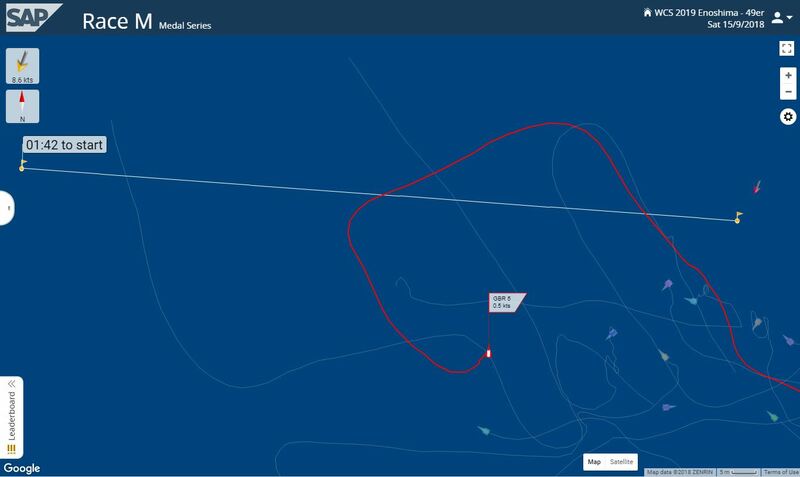 This would have been to confirm the bias on the start line and check their sailing angles upwind, so they could see how the course was laid out relative to the wind direction. The breeze was favouring the right-hand (in the image) end of the line – also called the starboard or committee boat end. Once they had confirmed this they could finalise their strategy and move into the execution of the plan. They circled back around and placed their boat just to leeward of the pack of boats lining up at the favoured committee boat end of the line. This is what I mean by risk management – they weren’t trying to win the race by winning the best start at the favoured end of the line. There will be a lot of competition for that best start and only one boat could ever get it. All the others would get average starts at best, and maybe even race-ending shockers. 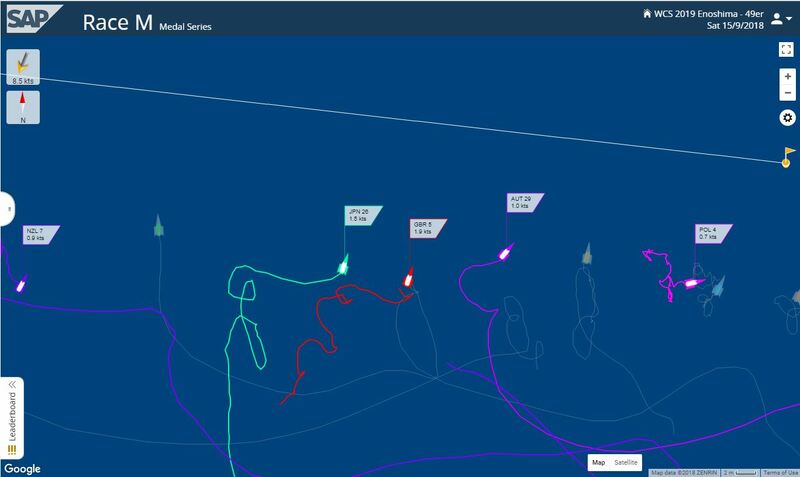 If we look at Image 2 with a minute to go to the start we can see that they had been working to maintain an optimal position relative to the boats either side. The best possible start is at full speed, close to the boat to windward, and with plenty of room to the boat to leeward. 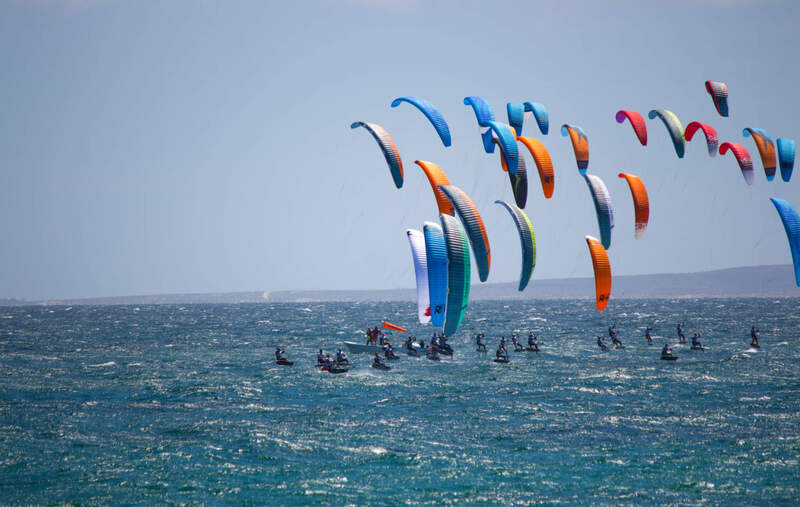 This allows you to bear away and sail a fast, slightly wider wind angle off the line, making it much easier to stay in clear air and in the front row. In Image 3 with 12 seconds to go they had continued this process of working their way up towards the group to windward with another tack to port and then back to starboard. This had given them more speed and more control of their boat compared to the five boats to windward, who were all trying to hold a single position for a long period of time. The inevitable outcome of trying to hold a position in a packed group close to the committee boat was that everyone ended up very slow. In contrast we can see that Peters and Sterritt’s strategy had allowed them to accelerate the boat a touch. The group to windward had no such opportunity in the tight space in which they were all jammed. I’ve highlighted several other boats in Image 3 so you can see the difference in boat speeds. The joint leaders, Przybytek and Kolodzinski in POL4 were only doing 0.7 knots, less than half Peters and Sterritt’s speed of 1.9 knots. Even the Kiwi pair – who were setting up for a very safe start way down from the committee boat (NZL7 all the way to the left in Image 3) – were only doing 0.9 knots. This was important in the final ten seconds before the start because acceleration is crucial off the line. 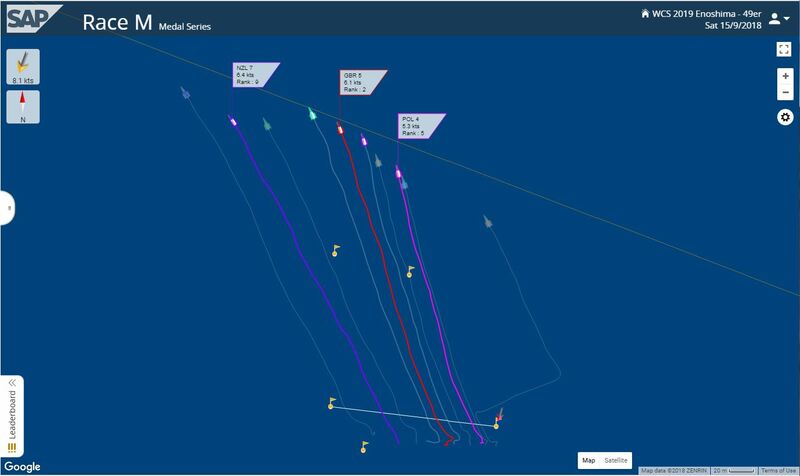 And in Image 4 from right on the gun, we see that GBR5 did one more tack to port and back to starboard to start evenly positioned between the boats either side – and going 1.4 knots quicker than both. It didn’t take long for that kind of speed advantage to turn into a bow-forward, controlling position in the front row off the start line. We can see all this in Video 1 below – in particular look for the British pairs extra speed and better acceleration allowing them to pop out quickly from a position in which they appeared buried with ten seconds to go. 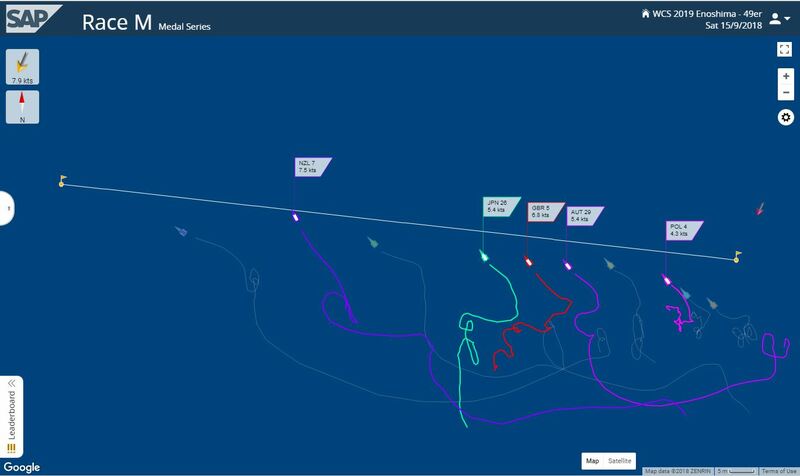 If we go back to Image 4 for a moment, we can see that the Kiwis also had a good start at full speed and right on the line – but they had given up too much of the line bias to the favoured end to get room for that start. In Image 5 we can see how Peters and Sterritt’s start strategy has played out to its happy conclusion. To their right, the Poles did not recover from their slow start in the group at the boat. While to their left the Kiwis suffered from the right-hand wind shift that was biasing the committee boat at the start. The British pair were already up into second, only challenged by the boats either side of them – and from here their speed and smarts meant they went on to win the race and the gold medal. Top Tekkers, lads. Next PostWatch today's WCS Enoshima medal races - LIVE!